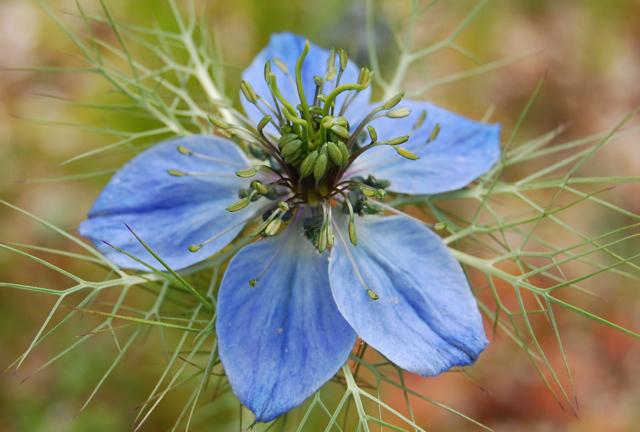 Love-in-a-mist – A favourite flower of mine which makes a beautiful essence. Flower essences are a subtle form of energetic medicine that work as a remarkable catalyst for healing the body and mind by addressing underlying emotional and spiritual imbalances which are thought to be the cause of poor health. They are a wonderful tool for self-exploration and can facilitate great shifts in understanding. The unique qualities of the flowering part of the plant are captured in the remedy and stored in a base of water and brandy. Suitable remedies are then selected according to the individual’s needs and a blend is made up which is usually taken orally, though the essences may also be combined in a spray, massage oil or other medium. 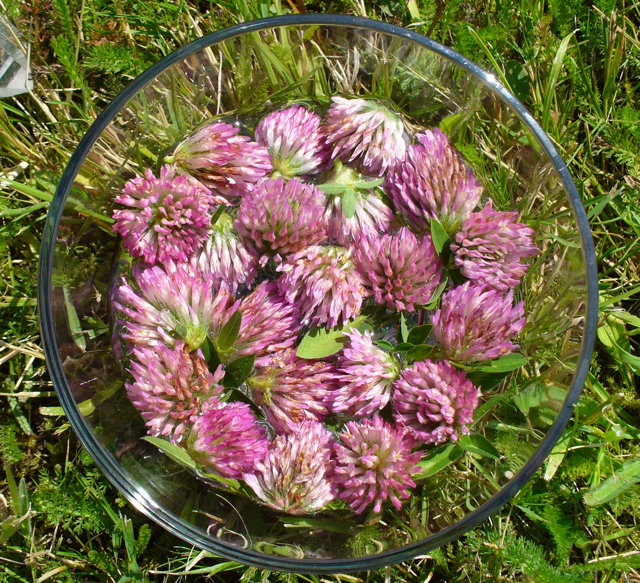 Love, respect and gratitude are the most important things when making a flower remedy. We are co-creating with nature in a beautiful process which can result in profound healing and understanding. I generally recommend working with only one flower at a time when making essences, whichever one calls to you. Try to be intuitive rather than rational in this. Spend some time sitting and connecting with your chosen flower, getting a sense of how and where it affects you. Do you feel a physical sensation? Does it make you feel calmer, lighter, more joyful? Does it bring up certain memories or associations? If these are painful, it may be the that the purpose of finished remedy is to help you address them. Itʼs ideal to use pure water from a local source, though filtered or bottled water will work if this isnʼt available. Its best to start early and have all the flowers picked by 9 oʼ clock to ensure at least 3 hours of uninterrupted sunlight before midday. This is because the sunʼs energy becomes draining rather than energising after 12pm. Pick enough flowers to fill the bowl, touching them as little as possible. If you plan to use the remedy for others, it’s good to use new tweezers or nail scissors to cut them to avoid touching them at all. Gently lie the flowers on the top of the water until the surface is covered and leave in full sun for 3-4 hours or until the flowers begin to fade, if this is sooner. 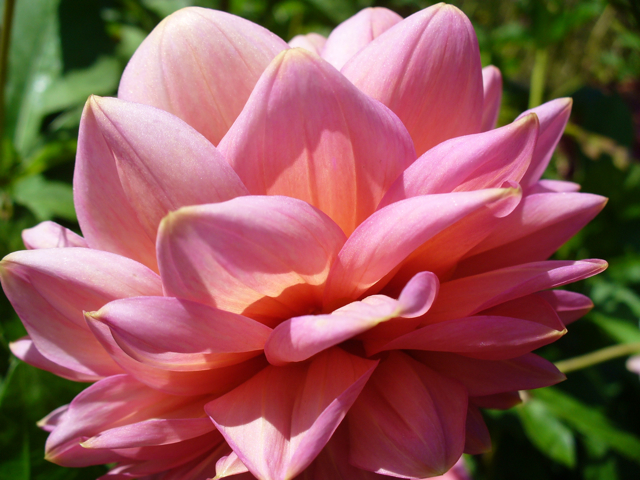 Spend some time sitting with the flowers or drawing them and giving thanks whilst they are infusing. When the time has passed, remove the flowers using a stalk or leaf of the same plant, being careful not to touch the water. Unless the remaining water is completely clear, its best to strain through a coffee filter or cheesecloth to ensure no plant matter is left behind. Half fill your dark glass bottle with the flower essence water and top the other half up with brandy (40% proof is advised to prolong the shelf life). This is your mother tincture, label it with the date and the name of the flower. After tasting a little, return any remaining essence water to the earth around the flowers youʼve been working with. Give thanks in the ways that seem most appropriate to you. To make a stock bottle from your mother tincture, fill a 30ml dropper bottle 3/4 with brandy and 1/4 with spring water, then add three drops of the mother tincture. This will last a long time and enable you to make lots of dosage bottles which are the ones you actually take. To make the dosage bottle just add 2 or 3 drops of the stock bottle to another 30ml dropper bottle of 1/4 brandy and 3/4 spring water. As youʼll be using this quite quickly it does not need as much brandy to preserve it. Place 4 drops of this under your tongue or sip in a glass of water 4 times a day or as often as you feel the need. 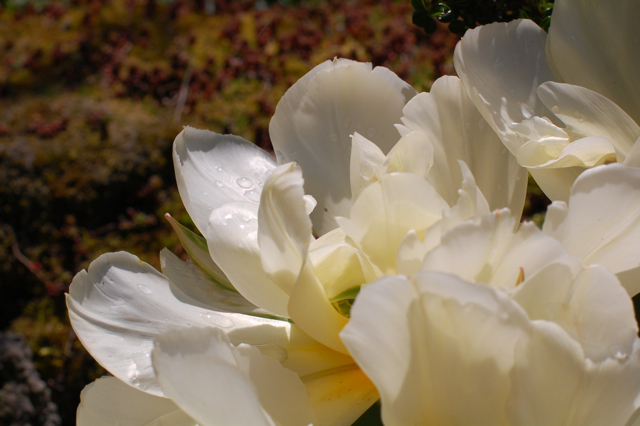 You canʼt overdose on flower remedies, though more frequent, rather than larger, doses are much more effective. beautiful blog lucinda!! i am sooo grateful for you! i am soooooo excited for elderflowers! i have an elder flower tree in my garden and i cant wait to make a raw elderflower cordial!! i absolutely adore the smell and taste!!! i will post some raw elderflower recipies up here as i have 2 very different ways! i would love to know if you have any recipies lucinda or ways you can use it in skincare! do you make elderflower essences!!? Why don’t you write your elderflower cordial recipes as a guest post and I’ll either put it up here or you could send it to Debs to post on the UK herbarium site for the June Blog party. well here are the 2 variations of making raw cordial, they arent mine, but i thought they were good to try out!! put elderflower heads, dates and lemon slices into a very large glass jug. pour overthe spring water, so that verything is well covered. put the lid on and leave to ferment for 2 -3 days. you will see the bubbles will rise up from the bottom, and if it is very warm then it will fermnt in 2 days and the lemon gives it that fizz like sparkling eldeflower champagne. 2nd variation is by kate magic! place flower heads into a large bowl. (try not to wash the elderflowers too much beforehand as it is the pollen in the flowers that you need). Put all the honey into a blender and add water into it gradually till you have a syrup. then you pour the syrup over the elderflowers in the bowl, pour in the vinegar and stir it all up. leave it for 24 hours, then strain it all through a nut milk bag. discard the pulp, and decant the cordial into a glass jug which should have a lid on it. leave some flowers floating around in it as it looks pretty. Oo yum. The first one sounds more like elderflower champagne and Kate’s one sounds more like a cordial you’d mix with water. Let me know how your experiments go! I might try Kate’s version as it sounds like a good way of preserving the elderflower after the season is over. I guess it would be worth using a light tasting honey so it didn’t overpower the elderflower though. You could try an elderflower infused honey too, ummm. Another trick is just to put a couple of heads in jar of fresh water and leave to cold infuse for half and hour to an hour, the taste is really lovely, even after so short a time. Its so refreshing and makes you skin feel really soft soon after drinking it. check it out if you have time. She says those who are drawn to elder and spiritual and having healing abilities which I’m sure you’ll appreciate as an elder lover. Fill a sterilized glass jar with elderflowers, leaving about 3 or 4 cm. space at the top. Add a tablespoon or so (depending on the size of the jar) of cider vinegar. Pour over this extra virgin olive oil to cover. Place in a sunny spot like a windowsill for about 2 – 3 weeks, stirring daily to prevent it from going musty. Strain through muslin into a sterilized glass jar. Cap, label and store in a cool dark place or in the refrigerator. For a stronger and more traditional infusion, repeat this procedure three times = a triple infused herb oil. That is: take another jarful of elderflowers, add the 1 x infused oil, topping it up if necessary. Leave 3 weeks … etc etc. Cider vingear extracts the water soluble fractions of the herb. Straining through muslin is preferable to using coffee filter paper as it doesn’t remove all the goodies (like filter paper does, though you get a nice clear oil). Olive oil is the most stable cosmetic oil, and best for making herbal infusions (i.e. it doesn’t go rancid like almond oil for instance). Thats an interesting recipe. I have just made a few batches of infused elderflower oil which I’ll be blogging about in the next week or so. Personally I feel that olive oil is too heavy for a light fragrance like elderflower and only use it for the heavier plant material like comfrey leaves or plantain. I like sweet almond for all fragranced flowers as it has little smell and shouldn’t go rancid if used within 6 months or preserved with a little vitamin E. I’ve got chamomile in apricot oil and a few others on the go too. I think you should match the oil to the plant material. Let me know how you like it if you make it as it’s all about personal preference! oh wow, thats sounds right about the olive oil. i found this recipe online, but i will make it with sweet almond oil instead then. ive found it quite expensive!! I was just doing some research for the blog party this month on flower essence, and knowing you are a flower diva, I knew I would find something lovely on your blog. I have a question though, we are scheduled for rain all week (it has already been raining 5 days in a row) – and I am worried that I shall miss the opportunity on some short lived flowers if I wait for the return of the sun (if it returns!). Can you make a remedy on a cloudy day? Well, this is an interesting question. I have always waited for some sun to do mine and have missed out on some things as a result. Talking to a woman I know who makes flower remedies recently however she said she does hers even if its cloudy and she believes it still works as long as you work with the nature spirits. I have found mine to be best when done in sunlight but I’m interested in trying some more in different weathers now to see if they come out as well. I always believed it was the energy of the sun that helped the plant imprint onto the water but there must be other ways of achieving the same thing. Maybe you could experiment on a cloudy day and let us know how it goes? That would be a very interesting angel for the blog party! Thanks very much Lucinda for the info! I think I may have to try that as the sun is showing no signs of making an appearance any time soon! It shall be an interesting experiment, indeed. Great information! I recently found Love-in-the-mist 8n my yard and have been trying to find more information about it herbally, but have not had much luck. Please share any other knowledge you may have about them! Thanks much! This is just beautiful…thank you!